This book brings together important information about complementary therapies and how they are used in diabetes care. It addresses the benefits and risks of complementary therapies and takes an evidence-based approach. 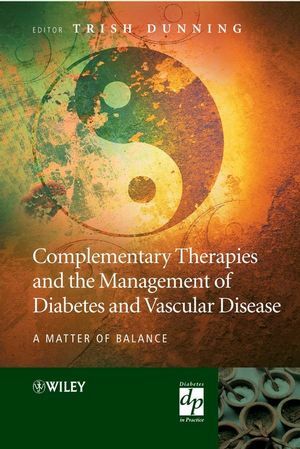 Complementary Therapies and the Management of Diabetes and Vascular Disease: A Matter of Balance provides health professionals with appropriate information about complementary therapies so they can discuss these therapies with their patients and help them make informed decisions about their diabetes care. It is an informative evidence-based text that will help health professionals understand complementary therapies commonly used by people with diabetes, their potential benefits, possible adverse events and how these could be minimised or prevented. It describes clinical practice guidelines for the safe combination of complementary and conventional therapies in diabetes management. It suggests appropriate advice to give people with diabetes and vascular disease about complementary therapies. Written by experts in the various fields, this book makes important reading for all health professionals managing patients with diabetes and associated vascular disease, including nurses, doctors, dietitians and podiatrists. Professor Trish Dunning, Director Diabetes Education Services and Clinical Nurse Consultant, Diabetes Education, St. Vincent’s Health Melbourne. 1 Introduction to Diabetes (Gary Deed and Trish Dunning). 2 Complementary Therapy Use (Mohan Pawa). 3 Complementary Medicine and Safety (Lesley Braun). 4 Integrating Complementary and Conventional Therapies (Trish Dunning). 5 Nutritional Therapies (Rocco Di Vincenzo). 6 Essential Oils (Aromatherapy) (Trish Dunning). 7 Counselling and Relaxation Therapies (Sue Cradock and Chas Skinner). 8 Energy Therapies (Geraldine Milton). 9 Herbal Medicines and Interactions with Conventional Medicines Used to Manage Diabetes (Lesley Braun). 10 Ayurvedic Management of Diabetes (Devaka Fernando). 11 Chinese Medicine Treatment of Diabetes (Kylie A. O’Brien and Charlie Changli Xue). 12 Australian Aboriginal Traditional Healing Practices (Heather McDonald). 13 Massage and Reflexology (Paula Mullins). 15 Complementary Approaches to Managing Pain (Trish Dunning and Leon Chaitow). 16 Manipulative Therapies (Russell Banks).